How does the world deal with over-population? In Downsizing, Norwegian scientists discover that shrinking humans to five inches tall is the answer. Also, they’ve proposed a 200-year plan in which the entire population of the planet will transition from large or small. Although a cinematic gem regarding visual realization and concept development, the film splinters in too many directions never fully developing the original idea. The trailers are misleading as Kristen Wigg (Audrey Safranek), Matt Damon’s (Paul Safranek) wife is featured as the main character yet, she’s only in the film for 20 or so minutes. From the get-go, Paul has been “all in” with the change as he’s living a somewhat “small” life. His dead-end job as a physical therapist for Omaha Steaks has never yielded the economic stability he’d dreamed of. Audrey’s parents are vehemently against the idea, which had a significant impact on her decision. Upon completion of the procedure—there’s no turning backing—it’s irreversible. Yep, final. Paul sees it as the answer to all of his money problems. Their $100,000 in assets translates to $12.5 million in the small world. 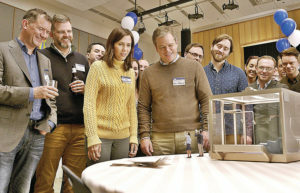 His friends, an exuberant Dave (Jason Sudeikis) and pampered wife Carol, (Maribeth Monroe) now 5-inches tall, have the perfect life living luxuriously in the seamlessly planned Leisureland community for the small. Nonetheless, once Paul is small, he ditches the fancy luxury home and moves to a little condo with a noisy, arrogant partying neighbor Christoph Waltz (Dusan Mirkovic). Now a frequent partier with his new friend Dusan, Paul begins to wonder where his life is going. As viewers, we’re left wondering, where is Kristen Wigg and where is the film going? An hour into the film we finally meet the shining star Hong Chau (Ngoc Lan Tran) a dissident Vietnamese refugee and amputee. Chau is on the Golden Globes nomination list for a Best Supporting Actress for her performance in the film. Sadly, we don’t meet her until an hour and ten minutes into the film. She’s a breath of fresh air, literally; as she breathes life into the flattened storyline. Ngoc Lan Tran is Dusan’s housekeeper, who had been downsized against her will and exiled from her country. Once she finds out Paul is a physical therapist (a doctor in her mind) she persuades him to go with her to her home—an enormous tenement where other impoverished immigrants live on the outside of Leisureland on the other side of a massive wall. Paul’s eyes are quickly opened to the suffering and helplessness of the tenement’s people—while discovering his true purpose in life. If only the film would have continued with Hong’s desperate storyline—what a shame it moved quickly on to Norway with entirely new plotlines to contend with. Tonally, we are too disconnected from the characters; their scenes are simply too short. While cinematically gorgeous, Norway’s majestic mountains, northern lights, rugged coastline and deep fjords, are a beautiful picturesque addition to the film but don’t offer much in terms of plot. The ‘hippie’ colony Paul and his group encounter are seen as a cult by some, and again Paul finds himself buying into another farfetched ideology. And where does this lead us? It left me wondering why the original idea wasn’t fully developed. The Bottom-Line? Too bad Hong Chau’s character showed up so late in the film, she could have possibly saved it if she would have had a presence in the first half hour. A disjointed script, with odd-ball characters lead to an unrealistic storyline.